There are lots of things to consider when choosing your worktops and with so many products on the market the choice for the perfect worktop can seem overwhelming. The three main considerations are budget, which will greatly influence the type of material you choose. The second is practicality, how low maintenance do you want it to be, and the third is the look, what colour and texture you want, along with any deign details such as sweeping curves or thin edge profile. Your worktops will be used for preparing, serving and potentially, dining and will need to withstand regular intensive cleaning. They’re a natural focal point in your kitchen, complementing the units and flooring you choose, and they have become a key part of the design process, so it’s well worth taking the time to get this hardworking surface right, it’s also important to choose a style you like the look of as well as a surface that will suit your lifestyle. Laminate worktops are a great cost effective and versatile kitchen work surface and have become the most popular option on the market, they can mimic almost any other surface type, including slate, granite, quartz and wood. They are easy to clean and resistant to most household chemicals. Pros: Cost effective, antibacterial, can be made to look like more expensive materials, easy to maintain, easy to clean, hard-wearing, suits any style of kitchen from contemporary to classic. Cons: Some poor quality laminate can peel, burn or even melt, scratch and become unhygienic. At Riggzy Complete Kitchen Solutions we supply and install good quality worktops from the three leading manufacturers Bushboard, Duropal and Formica. Quartz overlay – With the Italian made MiniQ we can create and install stone replacement worktops at a fraction of the cost of granite. 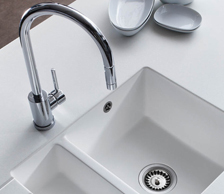 All MiniQ worktops are high quality engineered stone, manufactured to exacting quality standards. They are thin enough to fit perfectly over your old worktops but robust enough to stay in great shape for years to come. 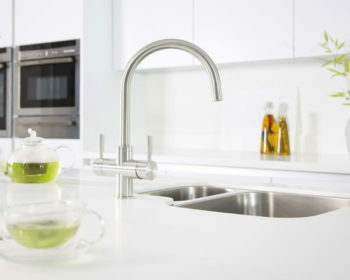 Quartz pre-finished worktops – Max-Top Quartz offers pre-finished worktops with undeniable strength and surprising lightness which means maximum benefit with minimum fuss. 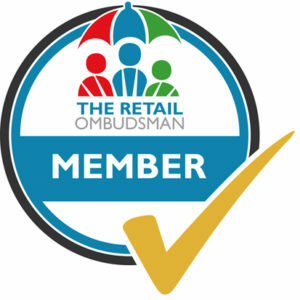 There is no need for fabricating making it a much quicker and cheaper option, it is the same thickness as standard 40mm laminate so replacement is simple and it can be installed using your standard tools. Both options come in a wide range of colours so visit our showroom to view our samples. 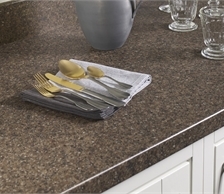 Pros: Hard-wearing, antibacterial, easy to clean, good range of colours, fraction of the cost of granite. Cons: Cannot be curved, visible joins. 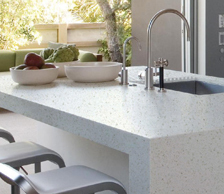 Solid surface worktops (also known as composite worktops) provide an extremely durable, easy to clean and damage resistant kitchen surface that can maintain its good looks for years. Whether being used in a domestic kitchen as a work surface or commercial project such as hotel, retail or healthcare the design capabilities are endless. 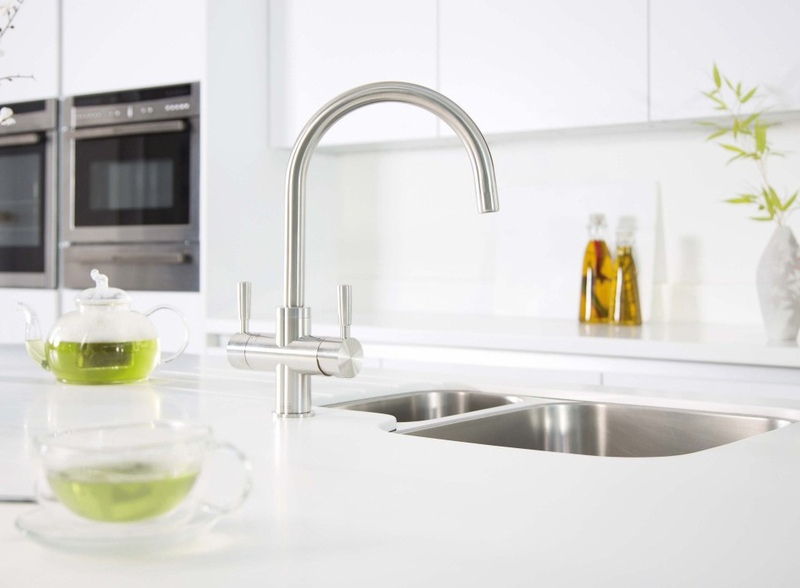 With options like splashbacks, upstands and breakfast bars in variety of colours, there are no limits to your design. At Riggzy Complete Kitchen Solutions we supply and fit: Hanex, Encore and the brand new and ultra-thin, Metis (15mm slimline solid surfaces which are designed perfectly to offer style and efficiency in the kitchen due to their slender build and shape). Pros: Heat and scratch resistant, any minor scratches can be polished out, seamless joins, stain resistant, can be moulded into any shape, slimline options. Cons: a more expensive option. The beauty of solid wood lies in its warm tones. When choosing solid wood instead of other worktop types, you benefit from the ability to maintain and enhance its fantastic natural rich and warm look. Whether you are after a contemporary or traditional kitchen, hardwood is a great solution, as long as you are willing to put the work into its maintenance. Pros: Cheaper than stone options, variety of wood grains and colours, antibacterial if maintained, looks great with age. Cons: Requires regular maintenance, can become stained, can scratch. Something to consider: The drawback with wood compared to stone or composite options is that it requires regular oiling to keep away stains and damage. However, you may see this as a benefit as the worktop will age over time, gaining a beautiful patina. 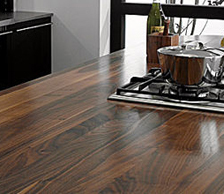 At Riggzy’s we recommend and supply solid wood worktops by Tuscan, they are sanded to 400 grit and come pre-oiled bringing out the natural characteristics of the wood. Extra oil is supplied for the ongoing care of your work surface. 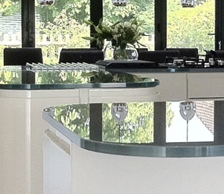 Choosing glass for your worktops can add a complete new dimension to your home. Easy to clean and very hygienic they are the perfect work surface, painted to any colour, and with different finishes including rainbow sparkle effect they can make your home look amazing. All worktops can be produced incorporating CNC cuts for hobs, sinks and taps, along with drainage grooves. They are easy to keep clean and add a modern contemporary look to your home. Pros: Can be made in any size or shape, easy to clean and hygienic, extremely durable, heat resistant, limitless range of colours, looks modern, stylish and sleek. Cons: An expensive option, needs frequent cleaning. At Riggzy Complete Kitchen Solutions we can arrange a full template and installation service. If your planning a complete new kitchen installation or updating your existing kitchen then pop into our showroom for advice, product information and to view our range of samples.